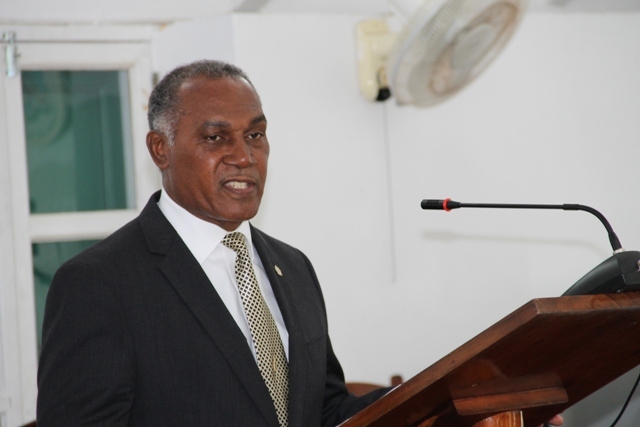 NIA CHARLESTOWN NEVIS (DECEMBER 10, 2015) — Premier of Nevis and Minister of Finance Hon. Vance Amory says the Nevis Island Administration (NIA) will seek debt forgiveness from the Federal Government in an effort to reduce the burden of repayment on the tax payers of Nevis. “My Administration will request that the mount of approximately $18.6 million of indebtedness of the NIA to the Federal Government for various loans and credit facilities granted under the former NIA to be written off thus reducing the burden of repayment on the taxpayers of Nevis,” he said. The Finance minister explained that the debt includes loans from the Sugar Industry Diversification Foundation (SIDF) and loan repayments to external creditors that were made on behalf of the people of Nevis. Mr. Amory also noted that the NIA would request the Federal Parliament to pass a loan guarantee to cover the outstanding restructured debt payments due to the St. Kitts-Nevis-Anguilla National Bank Limited, now that the administration has agreed on the settlement of the debt owed to the national bank.